Summary: The rules that define the permitted extent of Freedom of Movement within the European Union allow very much more control than the UK currently exercises. Working EU citizens are allowed in but non-economically active EU citizens can only stay longer than three months if they have sufficient finance and take out a comprehensive sickness insurance policy. Benefit/welfare tourism is illegal and EU citizens who have not been working have no rights to benefits. Theresa May was Home Secretary from 2010 yet she did nothing even though it was in her power simply to implement the rules as drawn up when the UK joined the European Union. This is an extraordinary example of massive and shameful negligence by Theresa May and provided much of the momentum leading to the success of the Leave campaign. One of the key promises of David Cameron’s government was to reduce immigration to a level of tens of thousands. The implementation of immigration policy was the responsibility of Theresa May, the Home Secretary from 2010 until she became Prime Minister in the middle of 2016 the responsibility of and. Around half the net migration into the UK was from countries outside the EU and therefore potentially controllable by the Home Office. The other half comes from the EU and politicians of all shades in the UK have accepted that the unrestricted freedom of movement (FoM) of people from the EU at any time was part of being a member of the European Union. 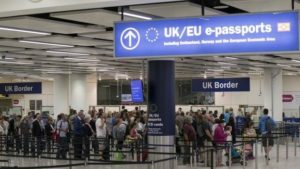 There is presently no attempt to track people coming into the UK with an EU passport or indeed to track them when they leave the UK. Estimates of EU migration are indeed estimates as accurate figures do not exist. In a comment by Colin Gordon in a piece on the leftfootforward.org website by Ian Dunt it is pointed out that, incredibly, the above understanding of EU citizens rights under the FoM provisions are being seriously misrepresented by politicians from all sides and in particular from those of the Leave campaign. This is detailed in: http://tinyurl.com/jjysrx9. A more detailed piece by Prof.Brad K. Blitz may be found at: http://bit.ly/1DG3I4I. For those who really have a lot of time on your hands, the regulations covering free movement of workers within the European Union can be found at: http://tinyurl.com/zl5rw4s (the website of the European Parliament). • EU-citizens not working do not have rights to Benefits. No-one has been prosecuted to-date under these regulations as the UK is not tracking movement of EU citizens in and out of the UK. The piece on: http://tinyurl.com/jjysrx9 also summarises research showing the current levels of benefit tourism (essentially undetectable) and also points out that research clearly demonstrates that migrants do not appear to reduce wages and do not appear to take jobs from the UK natives. Because migrants from the EU are young and healthy and keen to work, the HMRC said that in the year 2013/2014 recently arrived EEA nationals paid £3.1 billion in income tax and took out £0.56 billion in HMRC benefits. The fact that the British government has completely failed to implement the controls outlined above which already exist and do not require any changes in European Union legislation is utterly shameful. This negligence has contributed very substantially to the pressure that led to the success of the Leave campaign. The fact that Labour and the other political parties have also been unaware of these facts and, if they were, certainly not been prepared to talk about them is further evidence that the political system in the UK is so much poorer than the British public must have. Thank you for your kind words. It is nice to get a positive reaction. So often one wonders whether we bloggers are simply talking to ourselves, getting only a feeble grip of the shambles of what is happening in the UK. As you say, it can be thankless at times but we must keep on. Otherwise evil and stupidity will succeed. And it seems an awful lot of that around these days! Analysis of inward migration rights and controls needs to be complemented by information on the budget for such controls. It is my recollection that May slashed the size of the Border Force, no doubt to show the Chancellor her support but this has left the country without the means effectively to police the current or any post-Brexit borders. A very good piece. It raises the question: why is the press not putting this out? I guess because the facts would show up large parts of the UK pop for the ignorant nupties they mostly are. I think this is a consequence of us all being overwhelmed by the volume of information available. It’s much easier to believe what you are told particularly if it is in a short and easily understood form. Whether it’s right or not is of secondary importance. I wonder how many of the 100+ visitors to that post in the last 12 hours actually bothered to click through to look at the more detailed accounts of all this. All we can do is make every effort to put this sort of information out into the public domain and try and make sure others see it and realise that what they thought was true might not actually be true at all. Combined with popular media outlets being dominated by organisations with their own agenda it makes it very difficult to make progress but we must not give up trying! Thank you for your comment.